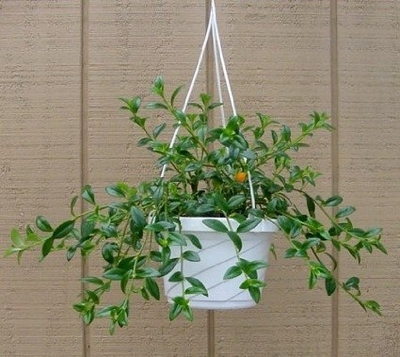 Home > Indoor Plants > Goldfish Plant - > Goldfish Plant - 6" Hanging Basket - Blooms Constantly! Easy to grow Prefers bright, filtered light Blooms year round Proper name: Hypocyrta glabra The plant you will receive is growing in a 6" Hanging Basket. The Goldfish Plant, from Southern Mexico and Brazil, is a small, indoor, hanging plant with waxy leaves and tiny orange pouched flowers. This plant needs bright light, but avoid full sun. A windowsill facing east seems to be the perfect place for this plant. Trying to keep the plant about 60 degrees in winter is said to encourage flowering. Prune the stems often in winter to encourage bushy growth and flowers. Keep the soil just damp while in flower. This plant will also benefit from fertilizers, but do not feed it in the winter. Also, you should slow the watering of almost all your plants while they're resting in the winter.